As a part of the professional development of our MAEUS students, the European Union Center offers students the opportunity for a trip to Washington D.C. in the Spring semester. This year's trip happened from March 21 to the 24. This article is Part Three of a series of posts written by different MAEUS students. In this article, Raphaela Berding writes about the third day of the trip, March 23. Previous entries in this series can be found here. The day on Wednesday started relatively early. The first meeting was with a University of Illinois alumna and Assistant Director of Federal Relations, and a representative from Lewis-Burke Associates, at the University of Illinois presence in Washington. The people we met with work with the University of Illinois campuses’ faculty and staff, UA offices, the alumni association and the foundation in order to advance the educational, research, health, and economic development missions of the University. Their office reports to the Office of the President, and their work includes monitoring and informing the University stakeholders about federal legislation and initiatives. The conversations during the meeting did not only revolve around their work but also around general advice about working in Washington. It was underlined by both how important it was to understand the priorities of the clients and pack the message so that they would right away see the benefits for them in it. Also, they stressed how important it was to have contacts in DC that would be of great help in order to get the foot into the DC door, for instance via an internship. The meeting was very insightful and it was interesting to see the work on the other side of the government. 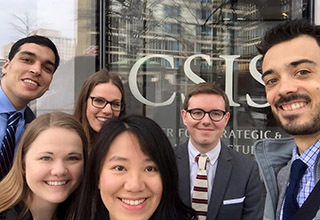 The second meeting of the day was at the Center for Strategic and International Studies (CSIS). We met with the Director of the Transatlantic Media Network, which brings journalists from different parts of Europe to the US, and is designed to foster closer relationships among US and European Journalists. I got the opportunity to talk about my research which concerns the question of European identity and culture. This turned out to be very insightful for me because because the Director worked as a foreign correspondent, commentator and senior editor for the Financial Times and the International Herald Tribune, and was very critical of my research. The trip to Washington DC was a very good opportunity not only to get input into our research but also to get an impression about job opportunities after graduation, and to see in which fields knowledge about the European Union was needed. It turned out that future job opportunities are very diverse. What all the people we met with emphasized is that when wanting to work on the Hill, it is important to maintain and build a good network because contacts and knowing the right people is a very important factor in DC.